Today I’m visiting my old stomping ground of Barton Aerodrome to talk to one of the guys in the control tower. The chap that’s featuring on the podcast is Mark Knowles and if you’ve ever landed or taken off from Barton chances are you will have spoken to Mark at some point. The first thing I asked Mark to do was to tell me about Barton, or City Airport, Manchester as it’s often called, and to tell me the type of air traffic control it has. Mark started by describing the aerodrome. It’s a grass airfield near to Manchester with 8 runways and they operate a Flight Information Service under the title Barton Information. 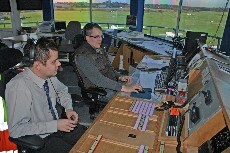 Mark works in the control tower at Barton, holding the position of Flight Information Service Officer or FISO. The title is licensed by the UK’s Civil Aviation Authority and enables him to provide an Aerodrome Flight Information Service or AFIS. I next asked Mark about the training that’s involved in becoming a FISO. He described how you can self study for the qualification. You study for exams in AFIS Procedures, Air Law, Navigation and Meteorology. Each FISO must then undergo a minimum number of hours of practical supervised training, where they learn all the local rules and procedures. They then sit a Validation, and successful passing of this qualifies them for 2 years, after which they will re-validate. In addition, regular competence checks are made to ensure a safe and high standard of service is maintained. Mark sees the role of FISO at a busy licensed aerodrome like Barton as being the eyes and ears of the ATZ whilst the aerodrome is active. A FISO at an aerodrome is only allowed to supply a ‘Basic Service’ The CAA describes this as: ‘an ATS provided for the purpose of giving advice and information useful for the safe and efficient conduct of flights. This may include weather information, changes of serviceability of facilities, conditions at aerodromes, general airspace activity information, and any other information likely to affect safety. The avoidance of other traffic is solely the pilot’s responsibility’. FISOs are not licensed to provide Traffic Service, Deconfliction Service, or Procedural Services. They do, however, issue instructions to traffic when on the ground, at the aerodrome, up to the hold point. I asked Mark about ‘read-backs’. He says that they are important, not just for the FISO but also for other pilots, helping to build up general situational awareness. A typical procedure for a departing aircraft would be firstly to familiarise yourself with the ATIS. The ATIS is available from a computer in the control tower and Mark says they would expect a pilot to have this information to hand when they first contact the tower. This information would typically, as a minimum, include the pressure setting and runway in use. The FISO will then give you taxi instructions to the appropriate hold point and this instruction should be read back. Bear in mind that the computer briefing system for the ATIS, that they have at Barton, isn’t necessarily widely available at all aerodromes. It is very much a local procedure for Barton. When flying into Barton you should be aware of the local airspace restrictions and inbound aircraft should aim to make their first call from 10 miles out. The web site, again, lists lots of useful data to assist with planning your flight into Barton. The Low-level Route between Manchester and Liverpool’s airspace has some interesting rules. Pilots transiting the Low-level Route should maintain a listening squawk of 7366. You should also monitor Manchester Approach on 118.575 Mhz but this is just a ‘listening watch’ and there is no need to talk to Manchester. Do check the Barton web site for the latest details on this before setting out but don’t let this put you off. I’ve flown the Low-level Route many times and it is pretty straight forward if you keep your wits about you. I next asked Mark what he expects from pilots that would make his job easier. He asked that pilots observe the PPR (prior permission required) rule. He thinks that it is important that the FISO knows who/what is inbound and when they are due to arrive. This is beneficial from a safety point of view but the initial phone call is also helpful for pilots in that the FISO can give them a briefing on the state of the aerodrome. For me the ATC element of training was perhaps the most daunting so I asked Mark how trainee pilots can get over this fear of talking to ATC. He suggested going to speak to your local air traffic unit. Being very friendly folks they should always welcome pilots who are keen to fly safely and even the busier airports will take time to meet you even if it has to be planned well in advance. 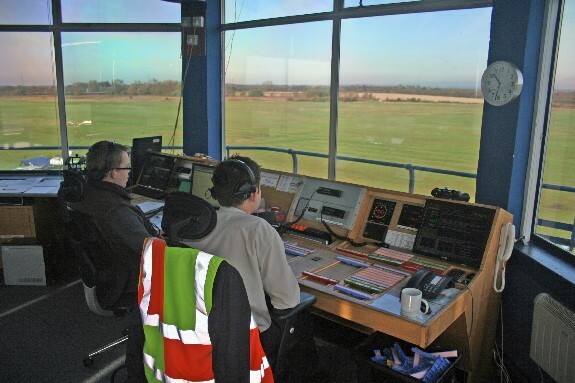 As it’s technically illegal to record and play back ATC transmissions – or, according to Mark, even listen to them, he suggests sitting in your aircraft and tuning in to ATC until you get a good idea of what’s expected of you. The FISOs at Barton have a few tools to help them carry out their role but as all of their work is done under VFR (visual flight rules) they don’t have such things as radar or landing aids. If they can see you and you can see them that’s all they need. They do use a Flight Progress Strip Display System which basically lists the aircraft that the FISO is in communication with on a board. Each strip contains the aircraft’s detail, destination, people on board, etc. They have VHF radios to communicate with aircraft in the area and they also have the Aldis lamps, red, green and white, just in case they need to communicate with non-radio aircraft. When I asked Mark what sort of personality type would suit being an FISO he said that FISOs need to fairly relaxed and be able to enjoy the role even though it’s very serious. Being logical is important and flexibility is useful in order to adapt your procedures when things get hectic. They don’t get many emergencies at Barton but they do happen, of course, from time to time. Mark advises that pilots do make a Pan-Pan or Mayday call when in any doubt about their flight. He stressed that they would prefer it if pilots did announce an emergency and not worry about causing a fuss. The FISOs have a check-list of what to do during emergencies, including alerting the airfield fire service or even the local fire brigade. None of the services mind being called out, so go ahead and call that problem. The FISOs at Barton include 3 full time, one part-time and three additional managers who can also act as FISOs when required. The FISOs work 10 hour shifts during summer months and 8 hours in winter. The tower is open from 8am to sunset for all of the year but they cap the late opening until 8pm, local time, during the summer. It’s a great little aerodrome and is well worth a visit. It can get busy at times so do check out the web site and maybe give the FISOs a call before flying in. This entry was posted in All Podcast Episodes, Flight Training, Flying Professionals, GA Flying and tagged ATC, Aviation, Barton, City Airport, FISO, Flight Training, General Aviation, Podcast, PPL by admin. Bookmark the permalink. Good to hear from the guys behind the microphones in air traffic. Can you do a podcast with a full ATC officer? I’ll give it a go, Dave. I’m trying to find an ATCO to help.